About this object Henry Clay of Kentucky served longer than any other Speaker in the 19th century. In 1814 he temporarily interrupted his tenure as Speaker by resigning his seat to negotiate the Treaty of Ghent. On this date, the House adopted a war resolution against Great Britain and Ireland, marking the first time it exercised its constitutional power to declare war. 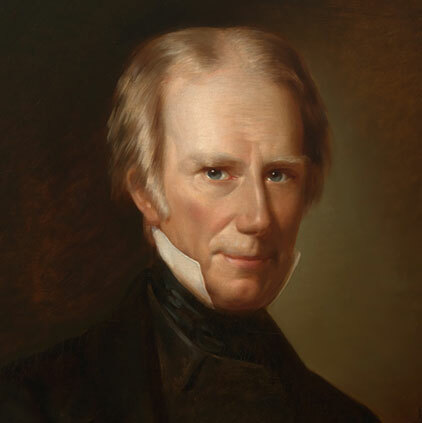 Led by Speaker of the House Henry Clay of Kentucky and the “War Hawk” faction, the House approved the resolution by a largely sectional vote of 79 to 49—with northeastern Members objecting and Representatives from states in the South and West supporting the measure. The conflict proved costly for Congress and the nation. British forces sailed up the Chesapeake Bay, routed a numerically superior force of militiamen, and swept into the capital city setting fire to much of it on August 24, 1814. The interiors of the House and Senate wings were ruined, and the Library of Congress suffered monumental damage. In the aftermath, Architect of the Capitol Benjamin Latrobe referred to the building as “a most magnificent ruin.” Clay eventually helped to negotiate an end to the hostilities. The Treaty of Ghent was signed on December 24, 1814, even as U.S. forces under the command of Andrew Jackson were repulsing British efforts to seize New Orleans.